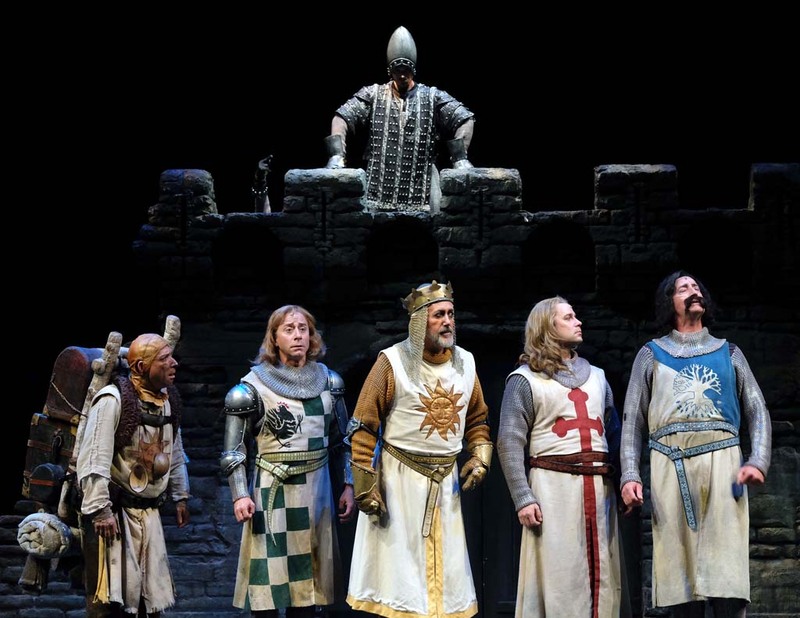 VISTA — Complete with clopping coconuts, killer bunnies, and taunting Frenchmen, Moonlight Stage Productions brings Monty Python’s film and stage classic to life with “Spamalot,” the company’s first musical of the summer season. The show follows King Arthur on his pursuit of a band of knights for the round table and then on his quest to find the Holy Grail. Along the way, King Arthur encounters a never-ending stream of silly obstacles, from the “Knights who say Ni” to airborne barnyard animals. San Diego native Brad Bradley spent over four years performing in “Spamalot”, starting when the show first opened on Broadway in 2005 and starred Tim Curry. Bradley subsequently took on the role of Patsy for the show’s national tour. For the first time, Bradley took on a new role in the show, that of director and choreographer, for Moonlight. Making his Moonlight stage debut, co-founder and artistic director of Cygnet Theatre Sean Murray leads the show as King Arthur. How do you ensure that such silly scenes come off as genuinely funny? Murray: No matter how silly these characters are, their logic is they’re completely committed to it. So if it is an incredibly intense argument over whether a swallow can carry a coconut or not, they are very seriously discussing it. And so, the more you take it serious and not play the silliness, the sillier it is actually. Bradley: You need actors that are fearless, actors that are going to take risks and allow themselves to fall flat on their faces and be laughed at in a bad way. If you have someone that committed to being so outrageous, then it becomes funny. Murray, what’s it like playing King Arthur? Bradley, what were the challenges of taking “Spamalot,” a show that you performed in the original Broadway production, and bringing it as a director to the Moonlight stage? From being there from day one, I had this vision of what the show should be… But the big challenge was that I didn’t want it to be a copycat. I did not want this show to be at all cookie-cutter. I wanted everyone (in the show) to have the freedom of they’re creating the show for the first time. What is the biggest difference between the Broadway show and Moonlight’s interpretation? Bradley: (At Moonlight) you’ll be able to see characters that Monty Python actually created. Sometimes in the original Broadway show, you saw celebrities. What is the real message of “Spamalot”? Murray: I think what he (King Arthur) ultimately discovers is that the Grail really has to come from inside, and then light can start to shine. Perhaps Murray this means that King Arthur swallowed it? But then again, it’s probably best to leave arguments over swallows to the show.